When you’re in the market for a crossover SUV near Mechanicstown, you have quite a few vehicles to choose from, but you should be sure to put the 2013 Honda Crosstour at the top of your list. Built off the Honda Accord, the Crosstour has come into its own as a versatile crossover that makes a great fit for drivers searching for a family vehicle. As we said, though, the crossover market grows year after year, and the competition is starting to get a bit stiff. Let’s see how the Crosstour stacks up against the 2013 Toyota Venza. Honda already has a huge advantage in their corner: they created the crossover. The popular CR-V birthed this segment in the auto market, and other manufacturers have yet to be able to make a noticeable splash among Honda’s crossover dominance. That’s a dominance that continues with Honda’s new crossover as well. Not only is the Honda vehicle less expensive, with the 2WD EX starting with a MSRP of $27,230* to the Toyota’s $27,700, but it also sports a more powerful engine, capable of 192 hp to the Venza’s 181 hp. Those might be small differences at first, but they are indicative of overall superior Honda engineering, as, despite offering more power, the 2013 Honda Crosstour 2WD EX with automatic transmission has a superior fuel economy too, getting an EPA-estimated 31 highway mpg** to the 26 mpg of the Venza. 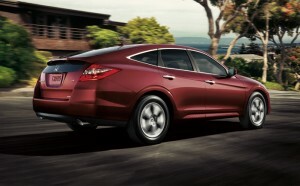 So, the Crosstour is less expensive, more powerful, and more fuel efficient — what else is there? Honda makes a rear parking aid a standard feature, increasing the safety of both the vehicle and its occupants when parking or backing up. Once you add in standard features like Honda’s power moonroof and theft deterrent system, it becomes pretty clear who the victor is. Numbers and features can only take a comparison so far — eventually you just have to see how the vehicle handles. Visit Middletown Honda and take the 2013 Honda Crosstour for a test drive to experience superior engineering first-hand. We’re conveniently located for Mechanicstown drivers and cannot wait to see you behind the wheel of a brand new Honda! *MSRP excluding tax, license, registration, $830.00 destination charge and options. **22 city/31 highway mpg rating for 2WD 4-cylinder models. 20 city/30 highway mpg rating for 2WD V-6 models. 19 city/28 highway mpg rating for 4WD V-6 models. Based on 2013 EPA mileage ratings. Use for comparison purposes only. Your actual mileage will vary depending on how you drive and maintain your vehicle.